Enjoy the purpose built West Coast Wilderness Cycle Trail that showcases the wild coastline and stunning forests and lakes of the West Coast. The unspoilt and remote virgin rainforest that this trail passes through several small communities and crosses rivers with scenery that will take your breath away. Discover the history and heritage of the gold rush days, the coal mining and greenstone. Day 1: Blenheim to Greymouth to Kumara (30km Ride) 8am start. Enjoy the scenic drive from Blenheim past the Nelson Lakes through the Buller Gorge to Greymouth. 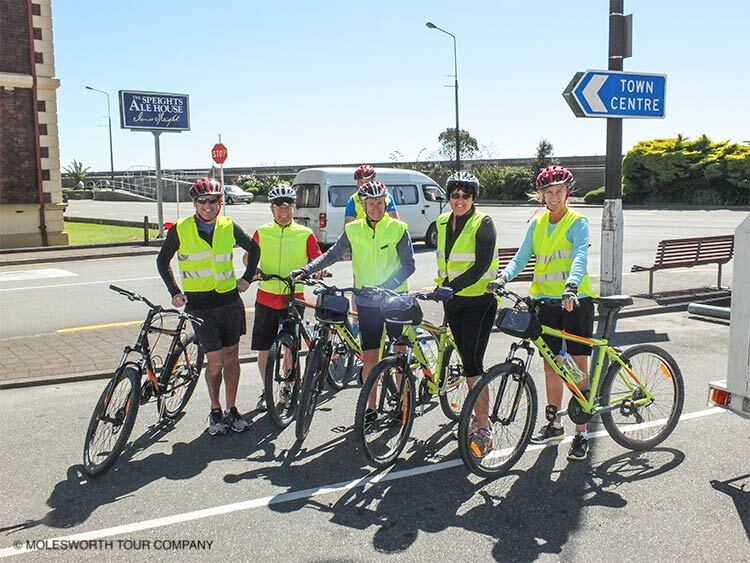 Alternatively you can meet the tour in Greymouth. Get a bite to eat at a local cafe before getting on the trail. This afternoon we will start our ride of the wilderness trail following the Grey River along its stop banks to the very river mouth to enjoy the trail along the coastline passing several small settlements as we follow the spectacular coastline of the Tasman Sea. The trail then continues on the old tramline to the historic gold mining town of Kumara Tonight our overnight stay is in a charming historic hotel in Kumara. The West Coast Wilderness Trail continues this morning with a ride through some spectacular rainforest. This section of the route is certain to become one of New Zealand's most popular cycle rides, offering stunning scenery and fascinating local history. You will pass through some of the best stands of native forest left in New Zealand as well as serene canals and streams. Enjoy morning tea with your support vehicle beside the canals. From here the trail climbs the Kawaka Valley to the pass this 13km section is worth taking your time to enjoy the scenery. Enjoy the descending trail through the forest and over a spectacular swing bridge canyon to arrive at the character filled Cowboy Paradise a replica Wild West settlement. This afternoon we will go to explore the beautiful Hokitika Gorge by bus and then back to our accommodation for dinner. Milltown overlooks the Arahura Valley, an area once rich in gold and still known as the source of the highly prized pounamu (greenstone). Your ride today starts at the head of the Arahura River, which rises from the Southern Alps and meets the Tasman Sea just north of Hokitika. You'll pass water raceways, rich dairy farmland and the tranquil Lake Kaniere, described by some as "the most beautiful lake in New Zealand". Formed by glacial erosion in the last ice age, Lake Kaniere itself is only 8 km long and 2 km wide but can be as deep as 195 metres in places and is surrounded by verdant native bush, making it a popular spot for campers and holiday makers in the summer. You bike through a section of towering ancient rimu forest and tree ferns. In the afternoon there is time to explore the heart of the town visit the greenstone factory, glass blowing and gold room or the museum. There is the option to take a jet boat ride on the Hokitika River. Tonight's stay is just out of Hokitika, we will have dinner in town. Your day starts with an easy coastal ride, then follows the bush tramway past Lake Mahinapua. It is a great ride through typical West Coast bush and wetlands. Following the old rail and tram lines to Lake Mahinapua. Here you can enjoy morning tea and choose to do the Treetops walk, a platform suspended 20 metres in the air amongst the tree canopy. The final leg of our cycle ride follows a disused railway line with a number of distinctive wooden bridges and Wild West coast coastal scenery to the gold mining, farming and forestry town of Ross. After exploring the town and having lunch we will drive back to Blenheim, arriving by 7pm. Please advise us if you have any special dietary requirements. Inclusions are all meals while on tour, snack food and morning teas in remote areas. Cafe stops are optional extras and cost of purchases is at your own expense. If you have any particular food allergies or dislikes please let us know on your pre-trip booking form. Tours operate on set departure dates which are posted on our website www.molesworthtours.co.nz on the individual tour pages or else the dates are included with your information pack. However for groups of six or more people we can look at additional tour dates. You will need a moderate level of fitness with some off road experience biking on shingle surfaces. Biking is grades 1-2 with optional grade 3 biking for those who want it. In the interests of your safety please ensure you disclose any medication that you are taking or any medical conditions or allergies that you have. The information form is the ideal place to disclose any information however if you prefer to talk to us in person please do not hesitate to contact us. The tour starts 8am from Blenheim on day 1. We will have plenty of storage space a good suggestion two smaller bags are better than one large heavy bag and a small bag to carry in the vehicle. Travel packs, sports bags or soft sided suitcases are the easiest way to store and access your luggage. $1495 per person, twin/share room; single supplement options are available at $250. Tour includes four nights accommodation and most meals while on tour, morning teas in remote areas. Cafe stops are optional extras and cost of purchases is at your own expense. $150 bike comes with use of a helmet and high visibility top. Contact us with your preferred tour date and we will check availability for you, you will need to fill in our booking form and confirm your tour by sending a deposit of $300 per person and complete the customer declaration form and send back to us. We can process Visa or Master Card credit cards, give us a phone call, we accept NZ cheques or direct banking payments. We will send a receipt and a pre-trip document detailing what to bring, departure times etc. Is due one month prior to your tour departure date. A deposit of $300 per person is required to confirm your tour. Should you have to cancel there is the option of transferring to another tour date, if this is not suitable we will refund you $150 of your deposit. Cancellations received after final payment has been made-50% of the total paid will be refunded. We understand that cancellations can occur due to illness or unexpected event therefore we recommend that you take out comprehensive travel insurance. We look forward to your enquiry about our West Coast Wilderness Cycle Trail adventure.